Since Axel came into rescue, his life has certainly changed for the better. His skin and coat are gorgeous and he is such a handsome boy. His foster mom reports he is a real sweetheart!. Axel is healthy, neutered and microchipped. 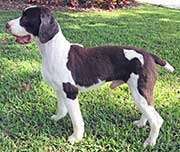 Don’t let the fact that he is 10 years old fool you – he is a happy healthy Springer with lots of energy. Axel walks beautifully on the leash and is crate trained. He is housetrained but sometimes may have an accident in the crate when his foster mon leaves him alone. No big deal – he just needs a little more work in that area. Undertanding that his people will always return will go a long way toward his comfort level. Axel does need to be crated when left on his own to feel comfortable. Axel is a good boy and waiting patiently (well, not that patiently) for his Forever Home. Axel is a 10-year-old bundle of love and can’t wait to share that love with you!